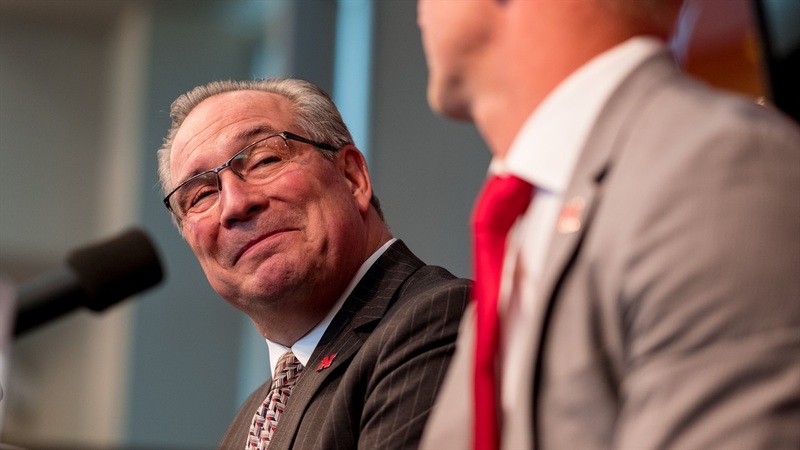 Nebraska athletic director Bill Moos joined Greg Sharpe on Monday night for his first monthly appearance on Sports Nightly of the new season. After a bit of discussion about Dorothy Lynch salad dressing (Moos is apparently a fan), Sharpe opened by inquiring about the fan excitement Moos has noticed among the fanbase following a recent trip to Beatrice. The excitement surrounding Frost’s return hasn’t been limited to the fanbase. Moos said he feels it in-house as well. As Moos has stated in the past, he’s not a micromanager. He hires his coaches and then lets them do their jobs. However, he did say he’s stopped by a couple of football practices this fall. A hot topic around Husker Nation recently has been the return of director of performance nutrition Dave Ellis, and Moos offered his two cents (or in this case, a lot more than that). Nebraska announced Ellis’ return on July 20 and Moos said Ellis is still putting his staff together. Moos stressed the importance of Ellis’ work with everyone in the athletic department to give the student-athletes the best chance for success. Communication and cooperation is something Moos has prioritized since his arrival in Lincoln. In the light of recent reports about the likes Maryland, Michigan State and Ohio State, Moos discussed the structure of the nutrition, sports medicine and strength and conditioning at Nebraska. “We’ve revamped it since I’ve been here,” Moos said. “It was a priority — we call it the performance area in our new structure. I put that under Dr. Todd Stull and that is what he’s in charge of. By that I mean nutrition, our training table piece of that, strength, conditioning. Dr. Lonnie Albers is still in charge of the sports medicine piece that works in harmony with Dr. Stull. Our NAPL, our performance lab, all those things are extremely, extremely important and all have to be in place for a program to really benefit from them. At the same time, there have to be reporting lines, there needs to be people you can go talk to if something may be out of whack. Moos said he holds all-staff meetings to talk about various issues and to make expectations clear. Moos said he wants everyone under his wings to be on the same page. Finally, Moos offered an update on the upgrades to Memorial Stadium. Fans that drive by over the summer likely noticed cranes towering over the stadium.